Mental Health Cops Help Reweave Social Safety Net In San Antonio : Shots - Health News Across the U.S., jails hold many more people with serious mental illness than state hospitals do. San Antonio is reweaving its safety net for the mentally ill — and saving $10 million annually. It's almost 4 p.m., and police officers Ernest Stevens and Ned Bandoske have been driving around town in their unmarked black SUV since early this morning. The officers are part of San Antonio's mental health squad — a six-person unit that answers the frequent emergency calls where mental illness may be an issue. We had absolutely no training 20 years ago in the police academy on how to deal with mental health disturbances. "A male individual put a blanket on fire this morning," Stevens reads from the blotter. "He's arguing ... and is a danger to himself and others. He's off his medications." A few minutes later, the SUV pulls up in front of the group home. A thin 24-year-old sits on a wooden bench out back, wearing a black hoodie. Jail is an expensive, ineffective way to treat the mental health problems that underlie some low-level crime, police in San Antonio say. In Part Two of her Morning Edition series, reporter Jenny Gold takes us inside an alternative treatment program. "You're Mason?" asks Bandoske. "What happened to your blanket?" Eight years ago, the next stop for someone like Mason would have been a hospital emergency room or jail. (Because of his condition, NPR is not using Mason's last name.) But the Bexar County jail, in San Antonio, was so overcrowded — largely with people with serious mental illnesses — that the state was getting ready to levy fines. This sort of situation is not unusual: Across the country, jails hold 10 times as many people with serious mental illness as state hospitals do, according to a recent report from the Treatment Advocacy Center, a national nonprofit that lobbies for better treatment options for people with mental illness. To deal with the problem, San Antonio and Bexar County have transformed their mental health system into a program considered a model for the rest of the nation. Today, the jails aren't full, and the city and county have saved $50 million over the past five years. The effort has focused on an idea called "smart justice" — basically, diverting people with serious mental illness out of jail and into treatment instead. San Antonio's new approach starts with the kind of interaction Bandoske and Stevens are having with Mason. The troubled young man is hunched over, and his eyes dart back and forth between the two officers. He mumbles answers to the officers' questions, sometimes stopping to stare at a spot in the distance. For outsiders, it's hard to know what's going on, but the officers say they can tell Mason is hallucinating. Bandoske kneels in front of him, trying to maintain eye contact and get Mason's attention. 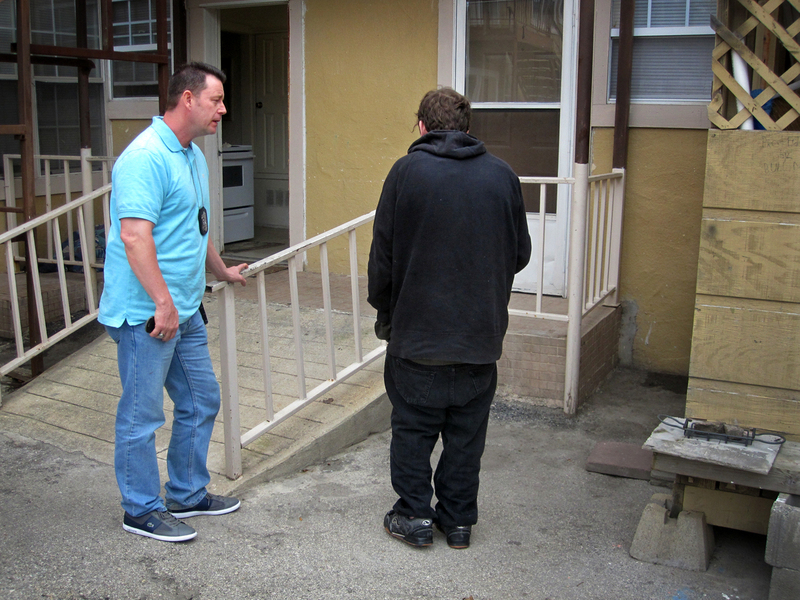 Officer Stevens responds to an emergency mental health call in regards to Mason, 24, at a group home in San Antonio. "Are you hearing some voices right now?" Bandoske asks. "You are, aren't you? What are the voices telling you?" Mason is silent, but Bandoske persists. "Hey Mason, you're seeing something that I'm not seeing. What is it?" These officers seem more like social workers than law enforcers. Stevens says that's a huge change from his early days on the police force. "We had absolutely no training 20 years ago in the police academy on how to deal with mental health disturbances," recalls Stevens. Back then, the police were repeatedly arresting the same people; many not only had a serious mental illness but were also addicted to drugs or alcohol, and were often homeless. And whether they went to the jail or the ER, it was expensive for everyone — the jails, the hospitals and the police department that had to pay for overtime while cops waited at the hospital. San Antonio's response was to require all officers to take a 40-hour course called Crisis Intervention Training, to learn how to handle mental health crises. But even with strong programs, there's only so much that training alone can do; there's still the problem of where to take patients like Mason. People who commit a felony still go to jail, regardless of their mental status. And those who need extensive medical care are taken to the hospital. But for patients like Mason, San Antonio built another option: the Restoration Center, a separate facility with a full array of mental and physical health services. The center was the brainchild of Leon Evans, director of San Antonio's mental health department. When he took over the department 14 years ago, Evans says not one of the county or city agencies and nonprofits that deal with mental illness was talking to another. The jails, hospitals, courts, police and mental health department all worked in separate silos. "People who fund these services only look at their little, small piece of the pie and whether there is a return on investment," says Evans. So, with the help of a county judge, Evans worked to get the funders together to talk about the money they were all spending on mental health. Once they stopped looking at mental health as an isolated expense, the groups realized they were spending enormous sums of money and offering poor care. Pooling their resources instead, they found, could offer significant savings. Everyone contributed funding to create the Restoration Center. It offers a 48-hour inpatient psychiatric unit; outpatient services for psychiatric and primary care; centers for drug or alcohol detox; a 90-day recovery program for substance abuse; plus housing for people with mental illnesses, and even job training. More than 18,000 people pass through the Restoration Center each year, and officials say the coordinated approach has saved the city more than $10 million annually. When Mason arrives at the center, nurse Catherine Riojas checks him in immediately. She gives Mason a physical and helps him get settled in an inpatient psychiatric unit that keeps patients for 48 hours. And then, about 15 minutes after the police officers walked through the door of the center, they're heading out again, ready to get back on the street. "OK, Mason, good luck," Stevens calls to the young man, and waves. "OK, buddy? Hope you feel better."